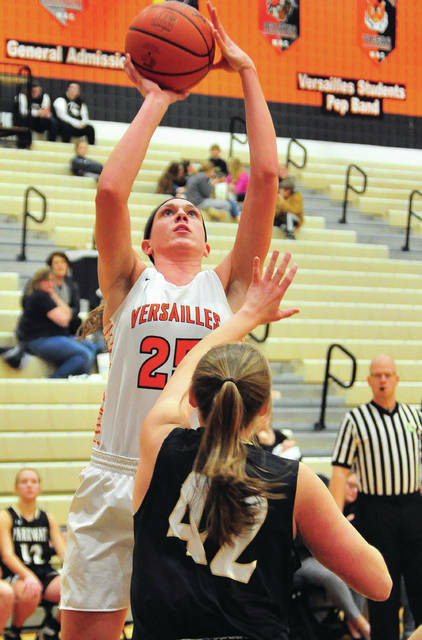 Versailles’ Liz Watren scores two of her 12 points Thursday night. Versailles’ Lindsey Winner shoots over Parkway’s Claire Eichler Thursday night. Versailles’ Caitlyn Luthman shoots a 3-pointer against Parkway Thursday night. 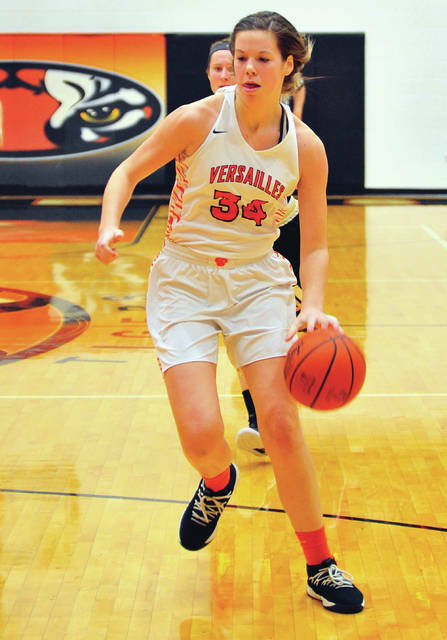 Versailles’ Brooke Stonebreaker drives to the basket Thursday night against Parkway. 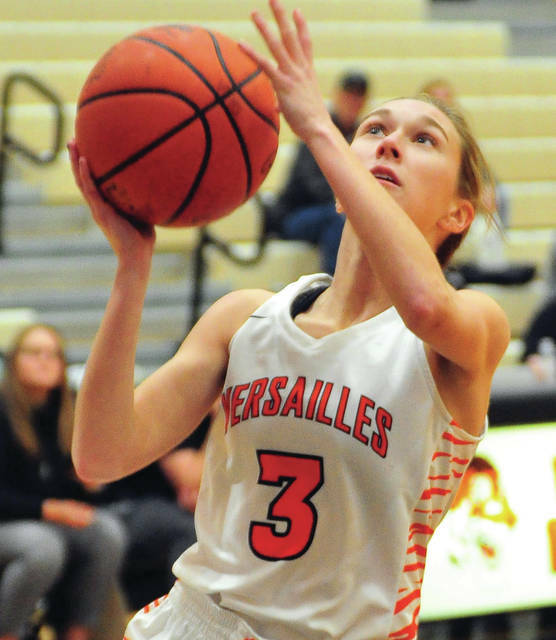 VERSAILLES —- In a matchup with Parkway Thursday night in Midwestern Athletic Conference action, Versailles girls basketball coach Jacki Stonebraker wanted to see one thing from her team. And she got exactly that from start to finish. Versailles jumped out to a 22-4 first quarter lead and cruised to a 71-20 victory to set up a big week next week. “I was really happy with how focused we were coming out,” Stonebraker said. Versailles improved to 13-3 and 7-0 in the MAC, keeping pace with Minster. The Wildcats are 15-1 and 6-0 after a win over New Bremen. Parkway dropped to 2-13 overall and 0-6 in the MAC. With the tournament draw looming, Versailles travels to West Liberty-Salem Tuesday, then Minster Thursday, before hosting Russia a week from Saturday. Both Versailles and WLS are in the running for the top seed at the D-III sectional, while the Minster game will likely determine the MAC champion. And the Tigers capped a tough week this week, after getting past Franklin Monroe Tuesday. Versailles sophomore Trevor Huber lost his life earlier this week from injuries suffered in an ATV accident. The Lady Tigers set the tone early and often Thursday. Caitlin McEldowney opened the game’s scoring with a 3-pointer. Lindsey Winner and Liz Ording followed with baskets inside, before a 3-pointer by Hannah Barga. Barga added a free throw, Winner scored twice more and Liz Watren scored on a layup to make it 17-2 with 1:33 to go in the first quarter and the Tigers never let up. Fourteen different Versailles players saw the court, with 10 finding the scoring column. Versailles led 41-11 at halftime and 60-17 after three quarters. Winner led the Tigers balanced attack with 14 points and 10 rebounds in limited playing time. Watren found double figures with 12 points. “It was great to see Liz (Watren) score like that,” Stonebraker said. McEldowney added nine points, Brooke Stonebraker had eighth points and six rebounds and Ording scored six points. Claire Eichler led Parkway with six points and five rebounds. Versailles was 29 of 58 from the floor for 50 percent and eight of 18 from the line for 44 percent. Parkway was nine of 40 from the floor for 23 percent and two of six from the line for 33 percent. The Tigers doubled the Panthers on the boards 36-18 and had 11 turnovers to Parkway’s 23. Kris Kirby 0-0-0, Rachel Barrett 0-0-0, Leah Harshman 2-0-4, Allie Ford 2-0-4, Claire Eichler 3-0-6, Stephanie Schaaf 1-0-2, Kelsey Nichols 1-1-3, Clara Hellworth 0-0-0, Elise Darrigan 0-1-1. Totals: 9-2-20. Caitlin McEldowney 3-0-9, Hannah Barga 2-1-7, Liz Ording 3-0-6, Lindsey Winner 7-0-14, Kelsey Custenborder 1-2-4, Brooke Stonebraker 4-0-8, Liz Watren 5-2-12, Savannah Toner 2-0-4, Caitlyn Luthman 1-2-4, Rachel Lyons 1-1-3, Abby Stammen 0-0-0, Kate Griesdorn 0-0-0, Emma George 0-0-0, Katelyn Marshal 0-0-0. Totals: 29-8-71. 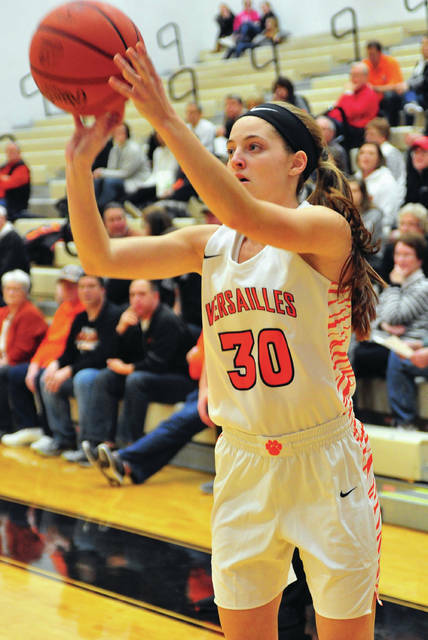 3-point field goals — Versailles: McEldowney (3), Barga (2). Records: Parkway 2-13 (0-6), Versailles 13-3 (7-0). Reserve score: Versailles 47, Parkway 16.